Based on a segmented MRI dataset of a normal subject, including nearly one-hundred structures . The program also allows simulation of motion (rigid; 3 translations, 3 rotations). A. Rahmim et al., Accurate event-driven motion compensation in high-resolution PET incorporating scattered and random events , IEEE Trans. Med. Imag., vol. 27, pp. 1018-1033, 2008. Voxelized phantoms are problematic in that they are fixed to a particular spatial resolution, and also result in interpolation errors when modeling motion (e.g. the volume of a voxelized object may not be conserved after rotation). Alternatively, a mathematical brain phantom was developed, containing continuous structures and thus avoiding the need for interpolations when introducing motion. The brain phantom was constructed using subdivision surfaces. Subdivision surfaces can be used to efficiently model structures with an arbitrary topological type, such as the brain, skull, muscle tissue, and vasculature. 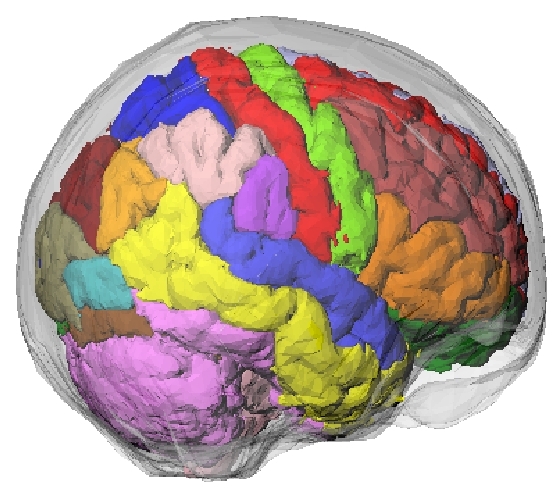 Surfaces were modeled based on a segmented MRI dataset of a normal subject. The dataset consisted of 181 slices of the brain (pixel-sizes/slice-widths of 1.0 mm’s). Nearly 100 structures in the brain were identified. A software application was written using the Visualization Toolkit (VTK) to create 3D polygon surfaces. The VTK marching cubes algorithm was first used to create an initial polygon model for each structure. The polygon model was then optimized using the mesh optimization and smoothing routines of the VTK software.